When Trish was asked to be the 'mistress of ceremonies' for the inaugural take it to the mat, The Great Yoga & Wellness Revolution event which features Toronto's finest yoga and wellness gurus, she readily accepted. She welcomed the chance to help others further their yoga and wellness journey with this unique event while supporting those with lymphoma. After watching her mother battle and conquer non-hodgkins lymphoma, Trish saw this as an opportunity to do her part to help raise funds and awareness for Lymphoma Canada's efforts to promote early detection and learn about lymphoma's causes and ultimately find a cure. "The stories of survival fill me with so much inspiration. When my mom was going through her battle with non-Hodgkin lymphoma, I wanted to help her so much I took every opportunity to learn about how yoga and nutrition can aid healing. I've seen first-hand the positive effects of wellness practices on individuals and their recovery. I'm looking forward to hosting take it to the mat and to helping raise awareness about how balanced living can lead to well-being." 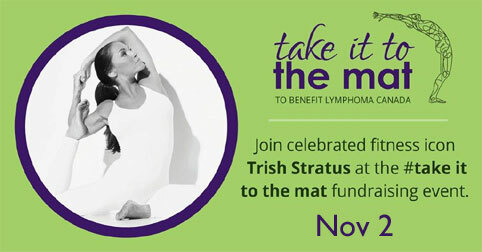 Trish is calling on her Stratuspherians to help support this great cause! To sponsor Trish on behalf of Team Stratusphere, please donate using the button below. Donations of $20 or more will receive a tax receipt. From the Toronto area? Join us as Trish hosts this amazing event! For more information and the schedule of events, follow this link. On behalf of Trish and all of us here at TrishStratus.com, we welcome you to Team Stratusphere and we thank you in advance for supporting this cause that is so close to Trish's heart!